On the Road Again… – WALK THE EDGE WITH US…. And so, after our best attempts to get it together, we are now on the road. After a sensational two weeks enjoying kids and grandkids in Winnipeg, Lac du Bonnet, Lake of the Woods and Edmonton, we have officially begun this epic trip of 2015. We have our planning done, all essentials in place (did I really bring enough shoes? clothes? This can’t possibly be enough clothes), and have our emotions (Glenda’s) in check. I can do this, I can do this, I can do this. Start date: middle of July. End date: who knows, but probably April or maybe May? We will be flying home to Winnipeg at least twice during that time. Yahoo. First stop, Kananaskis Valley, just west of Calgary. To our delight, we end up at a camping spot right on Lower Kananaskis Lake in a campground called “Interlakes”. What a great place. Deer, moose (a mother and baby, yet! ), mountain goats, bighorn sheep – it seems there are animals everywhere. We are able to put the kayak together right at our campsite and pull it down to the water easily. It turns out that the boating and hiking are spectacular with aqua blue water and indescribably beautiful mountains all around. Yes, we’re doing it. Wow, this is the life. After a week of this paradise, we are off to Whiterock to visit old, dear friends. It’s amazing how happy you are to see familiar faces on a long trip like this. It’s a lifeline that I know I can’t do without. Charleen and Ross invited us to their home, came for an enjoyable dinner out and then Charleen and I went for a long lunch and shopped for the rest of the next day. Of course, I didn’t need anything (although I did manage to add to that totally inadequate amount of clothes I brought) but the comradeship was everything. After an excellent visit, we were ‘on the road again”. 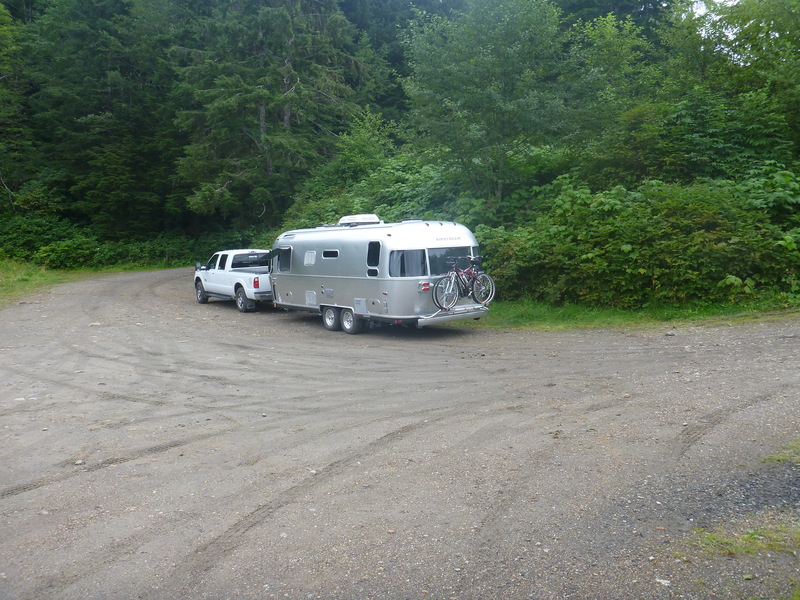 This time we were on our way to Seattle to get our awning fixed. That’s right, the awning on our new Airstream. This trip proved to be somewhat of a bad dream. The transition from the beauty of British Columbia to a major American city definitely did not fit into our dreams of retirement. Six or eight lanes of backed up cars, vans, trucks, motorhomes and buses, all of them filled with, you know, strangers, most of whom were probably really nice normal people, but, in our minds, lots of whom might have (this is a definite assumption; I really don’t know for sure) short tempers, road rage and who knows, maybe weapons? The traffic was terrible and from everything that’s been in the news, poor polite Canadians hardly stand a chance. When Jim pulled out a tad too soon in front of a shiny silver convertible, the driver nearly crippled himself turning in his seat, honking, yelling ( was that screaming?) and giving us the finger three or four times from nearly a standing position. How did he do that? We didn’t wait around to find out, but instead decided to get this done and get out of there. Hit it, Jim. On the road again, but a different road from that guy. Quickly. Awning fixed and several other small warranty items attended to, off we go. Now we’re heading back up to Canada (thank heavens) and onto our favorite place, beeeutiful Vancouver Island, land of lush forests, fabulous waterways and rain, rain, rain. However, July is proving to be truly enjoyable and we’re doing really well. That brings us to the present and as I write this we are sitting in a campsite on the August long weekend, somewhat away from huge crowds (but not entirely) and looking at the Pacific Ocean. Well, almost the ocean, this being an area of it called the Barkley Sound on the west coast near the town of Ucluelet. Wonderful. Another one of our brain storm additions: Our beloved Klepper kayak. How do you bring a boat with a travel trailer? Wilderness camping requires lakes and lakes require boats. Solution: a foldable kayak. Enter: our awesome Klepper. A Klepper is a type of kayak made in Germany with the same attention to detail and craftsmanship as a Volkswagon. Beautiful birch wooden pieces and heavy duty rubber and canvas come together in a short set-up time to make a kayak that is tough, apparently unsinkable (hmmm, remember the Titanic? ), and a joy to paddle. It fits both of us ( in kayak terms that’s called “tandem”) and has all sorts of lovely extras and surprises. Tons of storage room, open cockpit (none of this hiding your legs stuff), seats that make you as comfortable as on your living room couch, and a beautiful ride. We love it, its our baby and we’ve spent many, many enjoyable hours in it. Next page: Kayaking the Barkley Sound. Sounds like your having the time of your life! Have fun and keep posting!! !